Undergraduate/community college/career school criminal justice students. Forensic technician certificate programs. 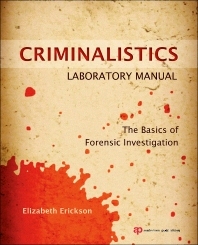 Elizabeth Erickson is an Associate Professor at the State University of New York (SUNY) College at Canton where she currently teaches forensic science and crime scene investigation courses. She is also a former Latent Print Examiner for the Onondaga County Center for Forensic Sciences in Syracuse, NY, and the Indiana State Police Forensic Laboratory in Fort Wayne, IN.